“Nobody tire in the struggle against the imperialists, the capitalists, and the robbers of the people!” General Leal said. 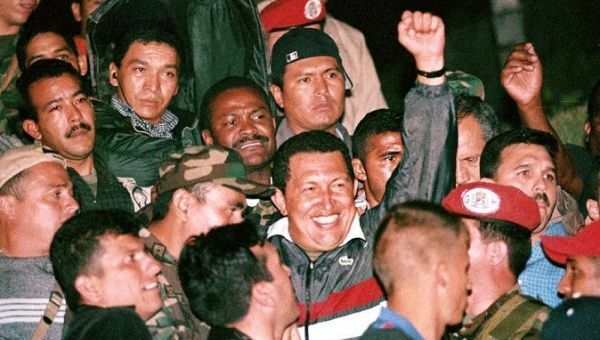 April 13 (teleSUR) Venezuela is today celebrating the founding of the National Bolivarian Militia and honoring the re-installation of former President Hugo Chavez following the failed coup attempt of April 2002. The militia was founded on April 13, 2009, with the aim of defending the Bolivarian revolution and connecting the National Bolivarian Armed Forces to the Venezuelan people. Venezuelan Defense Minister Vladimir Padrino said the militia represents the spirit and heritage of the revolutionary Venezuelan people, who defeated the attempt to remove Chavez in April 2002. Chavez was famed for his ideological push to deploy military personnel in the community to work on social projects that would benefit the nation as a whole. “It is the genuine expression of our ancestors, guardians of our homeland, fighters with no greater aspiration than to be the vanguard of the struggles to safeguard the revolution’s victories and social guarantees,” Padrino said. General Carlos Augusto Leal Telleria gave an impassioned speech against imperialism, and honored the spirit and history of the militia at a ceremony celebrating its founding and the victory against the 2002 coup. “Our Bolivarian militia carries the blood of its predecessors, that of liberators like Francisco de Miranda and Simon Bolivar,” General Carlos Augusto Leal Telleria said. On April 11, 2002, the right-wing organized violent protests, and parts of the military arrested Chavez, imposing Pedro Carmona as unelected, unconstitutional president. Carmona immediately attempted to undo the revolution, and Caracas’ working classes came down from the hillside barrios and surrounded Miraflores Palace. With a mass working class uprising having taken over streets and television stations, those in the military loyal to the Bolivarian revolution were able to retake the palace and reinstall the constitutional president. “Never in the history of humanity had power been retaken from a president in only 72 hours after a coup, perpetrated by the Yankee imperialists, the national and international bourgeoisie, the Catholic hierarchy, corrupt union leaders, media powers and fascist military leaders,” the former Venezuelan ambassador to Cuba wrote in an April 11 article for CubaDebate. President Maduro celebrated the event on Twitter: “Sixteen years ago, the people and patriotic soldiers took the streets to reestablish the presidency of Comandante Hugo Chavez and the democratic Venezuelan system. Long live April 13!